America: Who Really Pays the Taxes? America: Who Really Pays the Taxes? is a disturbing, eye-opening look at a tax system out of control. Once designed to spread the cost of government fairly, our tax code has turned into a gold mine of loopholes and giveaways manipulated by the influential and wealthy for their own benefit. Middle-income taxpayers pick up a growing share of the nation's tax bill, while our most profitable corporations pay little or nothing. Your tax status is affected more by how many lawyers and lobbyists you can afford than by your resources or needs. Our best-known and most successful companies pay more taxes to foreign governments than to our own. Cities and states start bidding wars to attract business through tax breaks — taxes made up for by the American taxpayer. In America: Who Really Pays the Taxes? 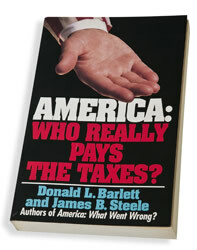 Barlett and Steele offer a graphic expose of what's wrong with our tax system, how it got that way, and how to fix it.